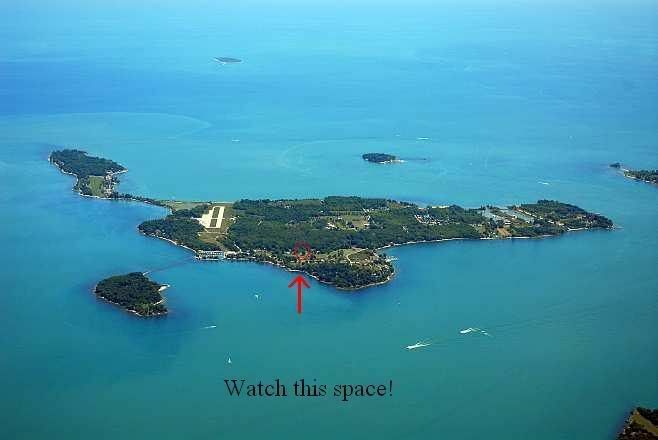 Today we closed on an empty lot on Middle Bass Island. The contractor should be breaking ground in 2-3 weeks, all we have to do now is wait for the building permits. The date was 11-8-03 when I flew the little Cessna I had at the time to a place called Put In Bay. Some pilots I knew had told me of it and how I should check it out some time. So on that November afternoon myself and a friend flew up there and had lunch at the Skyway, never made it to downtown but that didn't matter...some thing clicked that day and I fell in love with PIB and the Lake Erie Islands. The more I went, the more I loved it and I knew that someday I'd have to live up there. Thats how it all started. South Bass property is out of reach at this point of my life, there is just no way I can afford it right now with two kids still in grade school. Property on Middle Bass was a little bit more affordable, the lot has sewer and city water so that saved a TON of money not having to dig a septic and put in a well. It's not PIB, but we like it a lot. Everyone that we have met there is really nice, and our next door neighbors...you couldn't ask for any nicer people!! Who's knows...maybe 10-15 years from now the value might increase and we be able to sell it and get a place on PIB, or we may just love it enough and retire right there on Middle Bass. I wanted to share this earlier, but I wanted to wait till closing so I didn't jinx anything! So thats the good news for today! Congratulations!!! That is so awesome... Lucky you!!! Welcome to the upper islands. You will like MB...nice that you have "city" water, so much of MB has sulfur. And you are an easy walk to the store, post office, and town hall (which if you haven't been in there yet, wait to you check it out, a very cool building and take time to view the pictures hanging up). 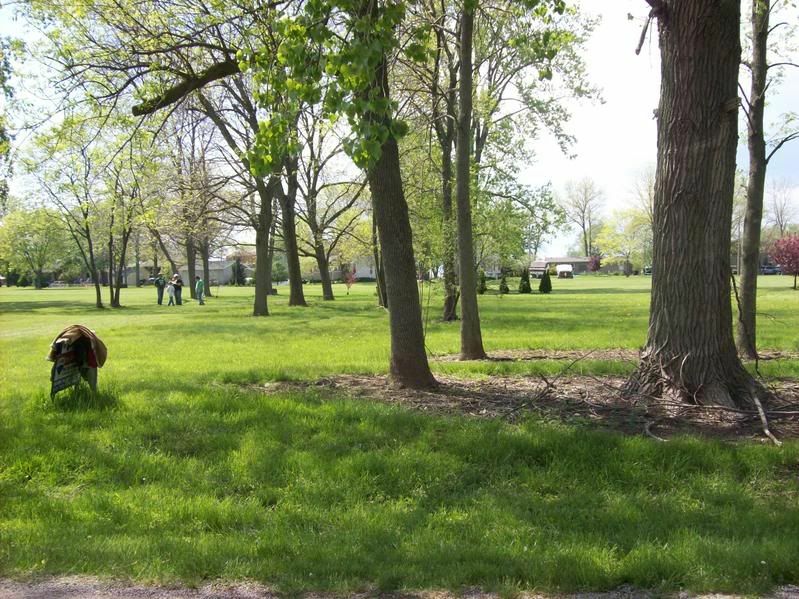 Ball games are a big deal, and when they play on MB it is a blast, and PIB invades. Quite the party. The Fine Art's Fest is fun, and great for the kids. Besides the pool there at the club house you have two nice places to swim with sandy bottoms. Although I quit going to School House, too busy, but off the marsh is kind of the new spot. You can find me anchored there pretty much every Sat. and Sun. I'm sure you have already looked, but if not you might want to check out an island neighbor's site, middlebass.org. Plus if you have any questions about the islands and the "drill" please feel free to ask, I will be happy to fill you in. FYI, Margie at the post office, John is your twp. worker, Art and Johnny are two of your firemen, Eddie or Jerry at the store and based on the photos of your boat ride over to MB a while back, you must have already met Stan, and my father is your twp. trustee. I also assume you met Ernie, right? If not then he is one of your neighbors. Well I wish you and your family luck and that you enjoy life on island time. Sorry about the double posts, but every time I post lately and hit submit, the site goes down and I get the server is unavailable so I redo it only to find that it did go through to begin with. How awesome! I'm sure you'll enjoy MB just fine! Plus, you are only a boat ride away to PIB and you won't have to put up with all of the tourists all the time. Im very happy for you. I can't wait to see more pics! Thanks for the kind words everyone! I'll definatly keep ya'll updated with the progress! [banned] wrote: Welcome to the upper islands. You will like MB...nice that you have "city" water, so much of MB has sulfur. And you are an easy walk to the store, post office, and town hall (which if you haven't been in there yet, wait to you check it out, a very cool building and take time to view the pictures hanging up). Ball games are a big deal, and when they play on MB it is a blast, and PIB invades. Quite the party. The Fine Art's Fest is fun, and great for the kids. Besides the pool there at the club house you have two nice places to swim with sandy bottoms. Although I quit going to School House, too busy, but off the marsh is kind of the new spot. You can find me anchored there pretty much every Sat. and Sun. Thanks I S L A N D E R, we did see the store, but it was closed. There was a number to call and the fellow that owns it would come over and open up. But I wasn't going to make him open up just to get some sodas! But you got to love it, this place is like Mayberry...almost too good to be true! I found that web site one night just doing a search, lots of history...I cant get enough history lesson on ALL of the islands. So I cant wait to see the town hall building! I remember reading somthing about Schoolhouse, thats on the east side where everyone hangs out right? I see lot of boats there when I am on final for runway 28. My one neighbor (a retired couple that live there full time) got pretty excited when I told them that I'll call them before coming up for winter visits to see if they needed anything from the mainland! Here is a picture of the lot, this is standing on the street looking to the west. We are one street and across the golf course fairway from the west S H O R E. It doesn't show up in the picture but there is a small view of the lake, and believe me when I tell you I am thankful for that little glimps! There will be two trees that will have to come down, they are right behind the 4 up front, one is partially hidden. I know the spot, and how nice it is. It use to be one of my favorite places to take my snowmobile...great fun catching some air over the hills around there. So it is kind of funny, I've zoomed, zoomed through your yard. (don't worry I won't now) While you may not be able to view the lake all that well from your place, you'll have no problem opening your windows to enjoy the sound of the water splashing along the banned line. Music to the ears. If you are willing to bring some things in for your neighbors during the winter it won't take you long to become the man. It costs a fortune to fly with both Griffin and Bob, almost 90 bucks, but with gas prices going the way they are I won't be surprised to see it pass 100. Well I'm a local historian and I'm pretty well versed in the history of all the islands so if you are interested in any info please ask, I just love to talk island history. In fact if you ever read the Gazette you may have read some of my NB history articles I write every month. And when I said before if you have questions about the drill, the store thing was a prime example of what I was talking about. Don't worry about calling Eddie, he only lives right down the road and it is common practice. Eddie and I use to play dress ups when we were little...the poor kid. [banned] wrote: I know the spot, and how nice it is. It use to be one of my favorite places to take my snowmobile...great fun catching some air over the hills around there. So it is kind of funny, I've zoomed, zoomed through your yard. (don't worry I won't now) While you may not be able to view the lake all that well from your place, you'll have no problem opening your windows to enjoy the sound of the water splashing along the banned line. Music to the ears. So thats where those snomobile tracks came from! J/K! I pass a Wal Mart, Kmart, 3 grocery stores, 4 hardware stores on my way to the airport. If there is room aboard the plane, I dont have one problem bringing something over, you're right, a little bit of help goes a LONG way! I love the island history so we'll get along just great! A couple years ago I became obsessed with the history and pictures of the Victory Hotel. It lasted only a few weeks because I ran out of things to read! My current intrest has been the Middle Bass Club, read about it in the Gazette (yep, I'm a suscriber and read it cover to cover!) last month. Monday when I was on Middle Bass I took some pictures of the homes and the Club grounds. Outside of the MBI website, I havn't had much luck finding any additional info about it. Were you involved in the North Bass Bootlegger tour last year? It looked like a lot of fun. You guys are making me want to sell my house and head west! How awesome it would be to live up there.